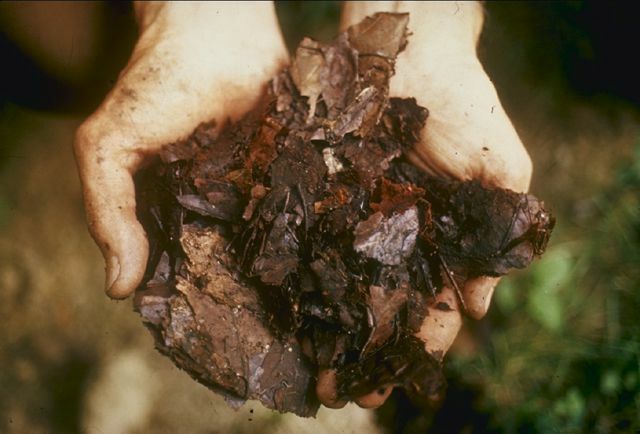 The term "hot composting" refers to a method in which microbial activity within the compost pile is at its optimum level, which results in finished compost in a much shorter period of time. It requires some special equipment, as well as time and diligence. But if you are determined to have finished compost in time to start a new garden bed or top-dress your garden, hot composting may be worth trying. The size of your compost bin or pile is very important when it comes to hot composting. Too small and the pile won't heat up sufficiently. A good size for a pile or bin for hot composting is 4 feet wide by 4 feet high, at least. In general, bigger is better, but four feet by four feet is a manageable size for most gardeners. The pile should be placed in full sun, if possible -- shade will cool the pile down a bit and slow the process down. You can just heap the materials up, or use a simple wire fence bin. Of course, if you're construction-minded, you can also build a nice, large bin out of wood or shipping pallets. The thing with hot composting is that it's best to have all of your materials on hand when you build the pile. Usually, we add organic matter to the pile as we accumulate it, but with hot composting, the whole point is to get the pile to heat up. For this, we need a large amount of organic matter, with the right carbon to nitrogen ratio, right from the start. No matter what you use, it is essential to chop it finely so it breaks down as quickly as possible. Often, the easiest way to do this is to run a lawnmower over the ingredients a few times. If possible, add a few shovelfuls of finished compost to act as an "activator" -- (commercial activators are unnecessary. Compost happens.) Mix the ingredients together (layering is not necessary, and often makes the process take longer), water it so the ingredients are evenly moist, and let it sit. The two keys to success with hot composting are monitoring soil temperature and moisture and turning regularly. The optimal temperature for microbial activity is 130 to 140 degrees Fahrenheit. You can measure this with a soil/compost thermometer, or by simply sticking your hand into the pile. If it's uncomfortably hot, it's at the right temperature. At 130 to 140 degrees, microbes are breaking down organic matter and reproducing at high rates. This temperature is also hot enough to kill most weed seeds and harmful bacteria in the pile. Monitor the temperature regularly, preferably daily. Once the pile starts to cool down below 130 degrees, it's time to turn the pile. Turning the pile aerates it, which will kickstart microbial activity again. After three weeks or so of this routine, (depending on the air temperature and other environmental conditions, such as precipitation) you will have beautiful, dark brown, crumbly compost to add to your gardens or lawn. Well worth the effort, and so rewarding.